The chill of winter can be a beautiful thing with freshly fallen snow, holiday lights twinkling and shimmering and the heart-warming act of giving gifts to others. Hopefully today's introductions will help you to enjoy these things just a little bit more this holiday season. Add the delicate elegance of glittering snow to your projects this winter with Freshly Fallen. These calligraphy-inspired flurries can be layered for more complex snowflakes or stamped individually for simple sophistication. Before you know it, you’ll be stamping a fresh blanket of snow on your seasonal greetings, scrapbook pages, and gift wrap. You’ll just love how easily your projects come together with this fabulously frosty set! Freshly Fallen will be available for purchase on October 15th. A coordinating die collection will be available for sale separately, retailing for $7. This collection includes a total of 6 wired dies. 3-3/4" x 3"
Jolly Holiday is a trendy, fun filled holiday set that is perfect for creating quick and simple one layer cards as well as cards and projects with more detail. It features a clean and simple design and lots of little extras that will make creating your holiday cards and projects extra special. 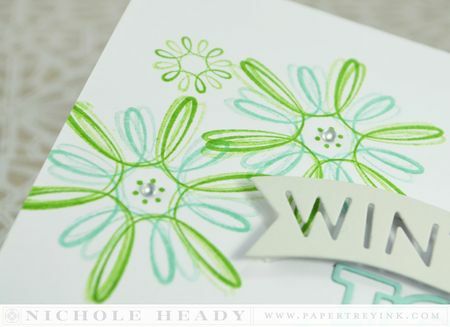 You will also love the coordinating dies which will make stamping and creating a snap. With crisp, clean images and a fun font combination, this holiday set will be perfect for sending and conveying your message during the holiday season! Jolly Holiday will be available for purchase on October 15th. Jolly Holiday contains a total of 18 images. The striped gift box assembled with the lid and bow measures approximately 1-1/4” wide x 2” tall. The larger tree measures 1” wide x 1-1/2” tall. The three larger stars measure approximately 3/4” wide x 3/4” tall. The striped wreath measure approximately 1- 1/2” wide by 1-1/2” tall. ‘Have yourself a merry little Christmas’ measures approximately 1” wide by 1” tall. ‘Have a jolly holiday’ measures approximately 2” wide by 3/8” wide. A coordinating die collection will be available for sale separately, retailing for $7. This collection includes a total of 9 wired shapes. 3" x 3"
The perfect little collection of images to create beautiful projects for Hanukkah. The large Star of David has a coordinating starburst image that can quickly take center stage on cards, tags and more. 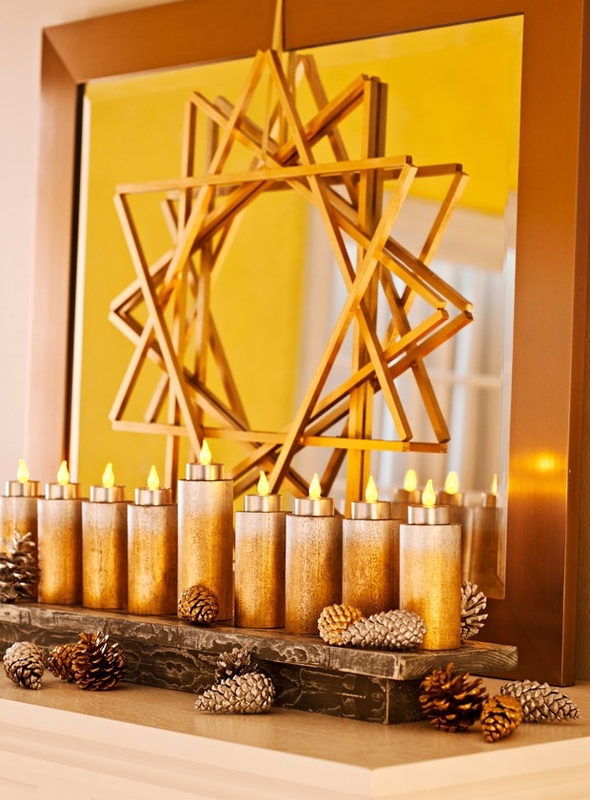 The candle images can be used to create a modern take on a menorah, above or behind sentiments. Festival of Lights will be available for purchase on October 15th. Festival of Lights contains a total of 14 images. The large Star of David measures1-1/4" x 1-3/8". The star burst measures 1-5/8". The "Love & Light" sentiment measures 2-3/4" x 3/4". "Wishing you" measures 1-3/8" x 1/8". The two candles measure 1" and 3/4" tall, and both are a little over 1/16" wide. The dot cluster measures 3/8" x 1/4". Keep It Simple: Hanukkah is the eleventh in a series of stamp sets allowing you to build a collection of basic, medium-sized sentiments, in a nice variety of fonts, that you can turn to again and again. With this edition we are focusing on "Hanukkah". The font choices will cover everything from modern to elegant. Keep It Simple: Hanukkah will be available for purchase on October 15th. Keep It Simple: Hanukkah contains a total of 9 images. All of sentiments average between 2-1/4" and 2-3/8" long. They average between 1/8" and 1/2" tall. 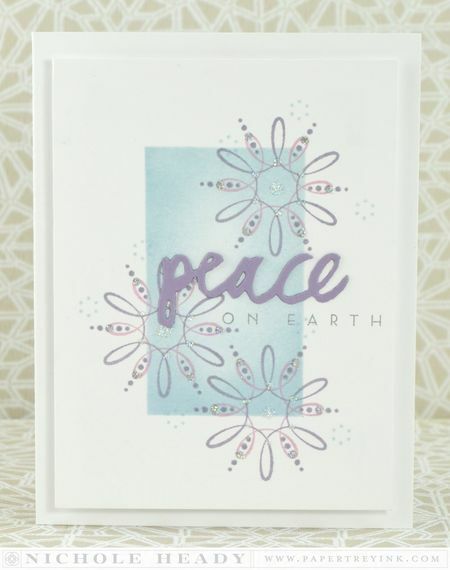 This mini stamp set contains a small frame and several small sentiments that are meant to coordinate with the label die included in the Shaker Shapes: Snow Globe die collection. Several different fonts were used, so there is sure to be the perfect sentiment, no matter what style project you’re creating. The snowflake images will coordinate with the snowflake confetti die also included in the Shaker Shapes: Snow Globe die collection. Snow Globe Sentiments will be available for purchase on October 15th. Snow Globe Sentiments contains a total of 16 images. The label image measures just slightly less than 2” wide x 3/8” tall. The largest snowflake measures just slightly less than ¾” x ¾”. The sentiments range in size from approximately 1” – 1 1/2” long x slightly more than 1/8” tall. 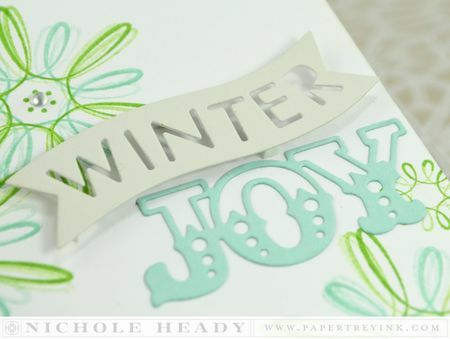 Erin Lincoln has out done herself with the winter seasonal stitching dies! Pair them up with any of our other stitching dies and more for gifts and special holiday keepsakes! The "pinwheel" style die with the Holly can be used to create a 3D holly berry. 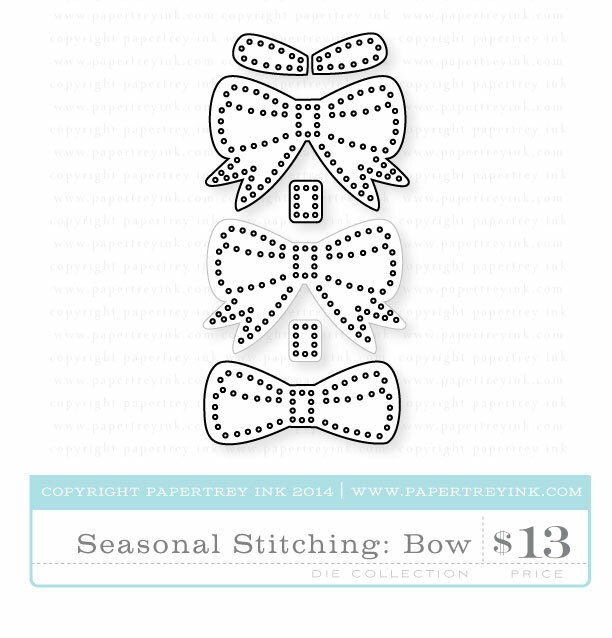 Seasonal Stitching: Bow die collection will be available for purchase on October 15th. It will retail for $13. Seasonal Stitching: Candy Cane die collection will be available for purchase on October 15th. It will retail for $6. Seasonal Stitching: Holly die collection will be available for purchase on October 15th. 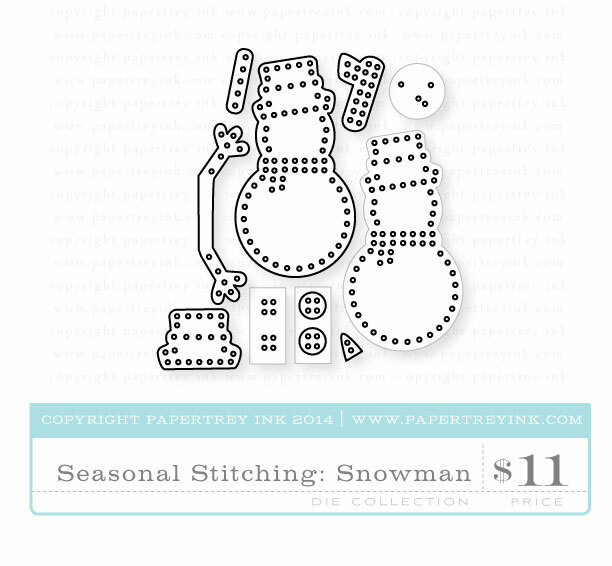 Seasonal Stitching: Snowman die collection will be available for purchase on October 15th. It will retail for $11. I could hardly wait to pull our Freshly Fallen and put it to good use! A bit of an untraditional holiday color scheme was used, New Leaf and Aqua Mist. 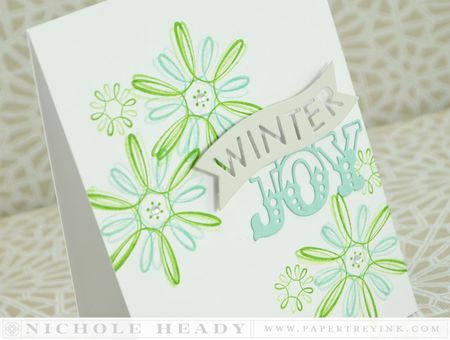 I triple stamped each layer of the snowflake without reinking to create this softer, generation stamping effect. The centers of each snowflake were finished with a small gem. I used the Phrase Play #9 die and the banner portion of it along with Soft Stone cardstock for the top portion of the sentiment. One of the dies from Holiday Double Cuts in Aqua Mist was perfect underneath that. Note that I kept the design to three of each snowflake for visual balance. A quick and easy single layer card! For my next Freshly Fallen project I used a lot of soft blues and purples, one of my favorite combos when making snow themed cards! I started by making off an area on my cover with post-it notes and sponging Spring Rain ink around the exterior of it and blending it inward. After the post-it notes were removed I was able to add the sentiment and snowflakes. The sentiment came from Wet Paint Holiday, with the die-cut in Winter Wisteria and the supporting sentiment stamped in Charcoal Palette. The snowflakes were done in layers of Winter Wisteria and Lavender Moon. The little dotted accents gave the snowflakes a very different look than those on my first project. I used a 2-way glue pen to add small dots and adhere Prisma glitter. The sparkle in person is just so pretty! The card front panel was adhered with foam tape for a bit of dimension. I have a little tag for you next, perfect for dressing up gift cards this holiday season. The Stitched Tag dies were cut from Classic Kraft cardstock, the bottom of the front stamped with Polka Dot Basics II using Fresh Snow ink. I die-cut the Seasonal Stitching: Holly die from Simply Chartreuse and Autumn Rose felt. The leaves were just stitched down the center with with embroidery floss, but I gathered the tabs of the dimensional berry die-cut into the center to create this beautiful and unique berry accent. All of these were actually glued into place to help save on time and make the arranging a bit more flexible. Two small stick pins accent the side of the berry. One of the large sentiments from Painted Poinsettias was stamped in the upper portion of the tag using True Black ink. I stitched the pocket of the Stitched Tag die onto the back of the tag. 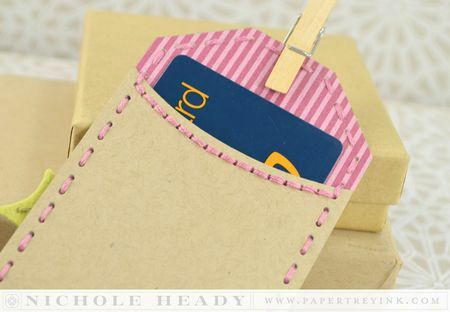 This is sized perfectly to hold a gift card, so this project is very practical too! I can definitely see mass myself producing these for teacher's gifts this year! You'll be seeing many fo the other new Seasonal Stitching dies used throughout the week! 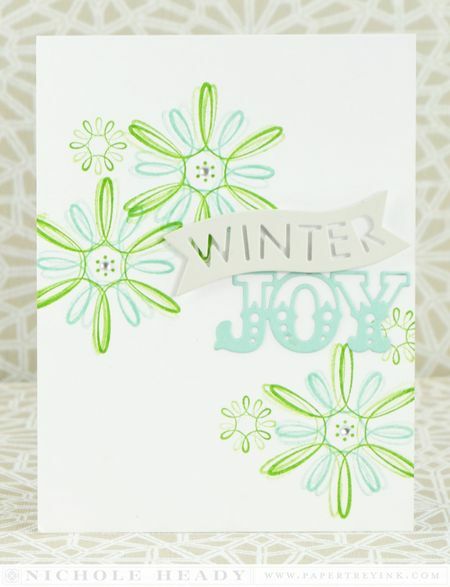 Melissa Bickford's Jolly Holiday set is so bold and modern, really bringing a fresh perspective on holiday stamping! Bright colors were on order for this project! I actually used the back of these tree stamps along with the striped fronts to acheive this look. I chose a monochromatic look for each tree, flipping the stamp over back and forth as I worked my way across. Then I added the stars and tree trunks to finish the arrangmeent off. One of the hills dies from the In the Meadow die set was used at the bottom. I edged it with a 2-way glue pen and then sprinkled it a bit with Faux Snow. 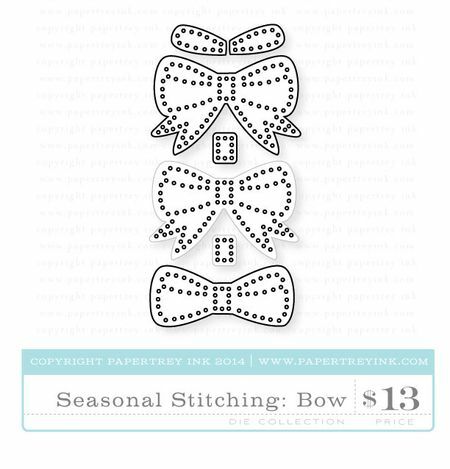 For my next Jolly Holiday card I created this fun stacked gift using a small stripe stamp in the set along with this fun modern bow. I used some old-school retro Christmas colors, Soft Stone, Hibiscus Burst, Pure Poppy, Pinefeather and Ocean Tides. I discovered that the new Snow Globe Sentiments set were a perfect fit for these stripes, so I added a few of them in True Black here and there throughout the stack. Kind of a fun way to incorporate sentiments! I scattered some silver star sequins around the stacked gift as well, adhering them with Glossy Accents. Everything is adhered to a Soft Stone card base. Now onto some Hanukkah projects! I kept things pretty simple with this design and used the two layer Star of David image from Festival of Lights on the front of this Enchanted Evening card, heat embossing them with Gold Filigree Embossing Powder. Don't you just love all the detail? I added a few star clusters around it using VersaMark ink. The sentiment was added using Keep It Simple: Hanukkah. A bit of gold embroidery floss was tied around the panel to help add balance to the sentiment. This design is a nice modern twist on a Hanukkah card, with bold stripes stamped in Spring Rain using Background Basics: Super Stripes. The candles from Festival of Lights were added in Enchanted Evening, with the flames added in Charcaol Palette ink. 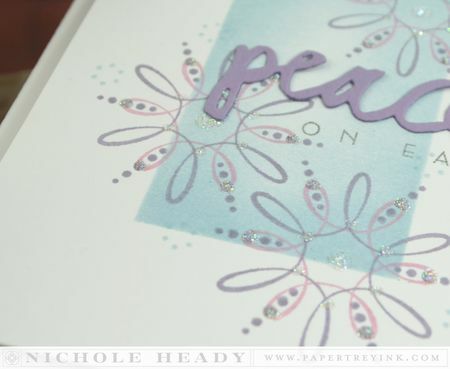 I heat embossed the sentiments as well as the dot clusters using Silver Filigree Embossing Powder. Super simple, but really such a dramatic effect! My last card is a great design I like to use with many of the Keep It Simple sets. I cut the Spring Rain card front into two pieces, allowing enough of a gap to tuck in my sentiment. The sentiment is stamped in Enchanted Evening and then this cross-hatched Star of David accents the top. Along the bottom edge I added candles and flames to create a border. I hope you have enjoyed all the creations that I have shared with you today! Which holidays will you be celebrating this year? Will you be crafting for them? Was there a particular project that sparked your interest today? We would love to hear your initial thoughts on everything we introduced! Please leave a comment on this post to tell us what you think of the new products and you will be eligible to win big! You have until 7am EST, October 12th to leave your comment and be eligible to win. Only one comment per person please. One randomly selected winner will be announced on our October Release Winners Page before noon EST the same day. Thank you for stopping by today and best of luck with the contest! Maile Belles will be highlighting Freshly Fallen. Betsy Veldman will be showcasing Snow Globe Sentiments. Laura Bassen will be featuring Festival of Lights and Keep It Simple: Hanukkah. FINISHED SIZE: 4-3/4" x 2-3/4"
Totally loving today’s projects! Can’t wait for the full reveal. Fantastic release as always. Another great preview – can’t wait to see the full reveal! Seasonal stitched holly looks fantastic – love the felt berry. Beautiful samples, but I agree with donna: the Hanukkah cards are my favorite. Thanks for the inspiration. Love those chevron trees!!! Great cards!! Beautiful cards today. This is so exciting! Mi proyecto favorito es la etiqueta con costura. Y las figuras navideñas con costura también lucen divertidas. I love the stitching dies. Beautiful cards from the whole team. Love the stitched holly card and can’t wait to see more of the stitched dies in action! Another day of fabulous ideas…and beautiful cards. While I told myself I didn’t need* anymore snowflake related items….the Freshly Fallen will be a set in my cart….for sure! Decisions, decisions. Which of these beautiful products do I like best.? Fab release! 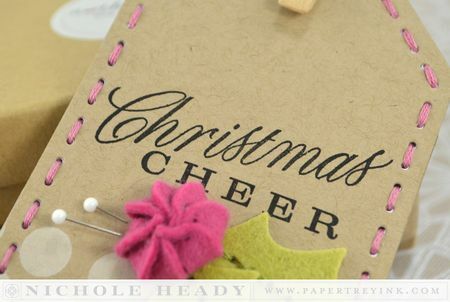 Love the tag with the stitched holly! I love the stitched dies and can’t wait to see more of it. Oh! 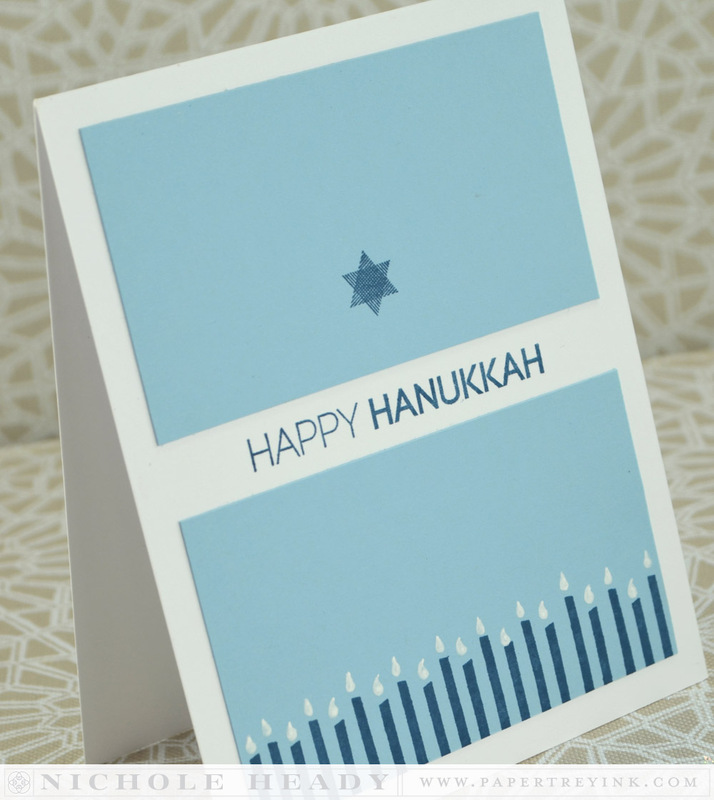 The Simple Hanukkah card is lovely! Thanks for the inspiration! Great cards! I love the modern look on the trees in the Jolly Holiday Set. I am loving this release! I always look forward to adding to my Christmas collection. Thanks for always inspiring. Beautiful projects! Love the new stuff!! Great release and inspiration! I love the trees in the Jolly Holiday set! Love all your cards. The updated look of the Hanukkah set is great. Freshly fallen is simply magical! The chevron tress are cute! Freshly fallen will have lots of potential, already have some great ideas! Freshly fallen is fantastic . Love the previews so far … can’t wait to see the rest of this release! So excited to get started on my Christmas cards! It is going to be so hard to decided what to use on them though with all these fabulous new products! Ooh… Freshly Fallen is beautiful. All of the projects are stunning! Love the look of Jolly Holiday. I really don’t need more Christmas stamps, but I just can’t help it! I loved every single card! So many ideas! Love the gathered berry, stitched holly leaves, and the stitched tag. So many fun holiday projects. Keep the ideas coming! Love Freshly Fallen and all the stitched goodies! The stacked gift card is so wonderful! By golly, be JOLLY! Love it! I particularly liked your Hanukkah cards today. The stitched dies always appeal to me, too. I am loving the seasonal stitched snowman and holly! Awesome projects created with some great new products! Great stuff as usual! I love the freshly fallen stamp! Can’t wait to see the rest! All of these stitched items are the perfect touches for holiday gift giving. These projects are amazing. Such a talented team. Thanks for the inspiration. As always, lots of wonderful projects with these new products. I can see that the Freshly Fallen stamp will get lots of use for more than snowflakes — so graceful! Freshly Fallen is so pretty! I’d use it year round! More fun today and freshly fallen has caught my eye! Beautiful work ladies! Looking forwards to playing with all these new stamp sets! So many great designs and ideas! PTI and the design team never cease to amaze. Love all the stitched products! Another bout of gorgeous cards to showcase fabulous Christmas products. Love them alllll! Beautiful and inspiring. Looking forward to tomorrow’s posts. Oh wow, love it all! Your projects are gorgeous again! 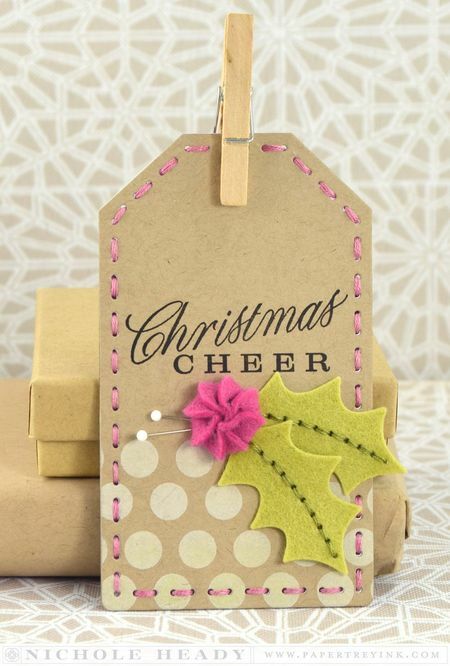 Love the stitched tag with the felt and your cards are amazing! again – a beautiful release – love the stitched tag and the classic trees in those bright colors! Stunning projects as always – LOVE the elegance of your products. Can’t wait for the new release! I love the stitched bow and snowman! Can’t get enough of the stitched look! Winter Joy is adorable! Can’t wait to play with it! Can’t wait to see the full sets! Everything looks great! great items today – love love love the stitching dies! Another day of beautiful projects. This is going to be a month of tough decisions. More great products revealed today! I think the holly die is my fav! The seasonal stitching dies have caught my eye. I love the little ruched flower, so cute. Awesome cards!! I especially love the tree and snowflakes !! Great release !! I love the stitched dies! The chevron trees are adorable. Love the variety of ideas for that set. I’m really looking forward to adding the Snow Globe Sentiments to my collection! All the projects are stunning and my favorites are Freshly Fallen and Jolly Holiday! 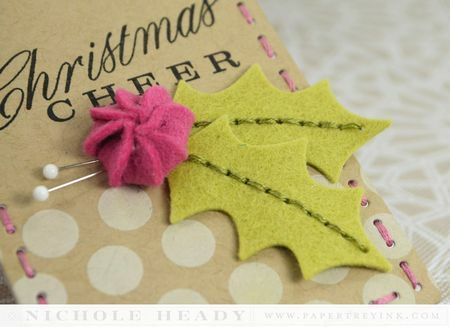 That stitched holly tag is so adorable…and I love the colors! Fabulous Hanukkah cards, too. I love the Jolly Holiday set and the stitched tag with the gift card is so great. Freshly Fallen looks gorgeous! Another set to add to my holiday collection! Fabulous! Love the felt stitched holly and berry the most. All of the samples look so fun. Also love the stitched bows. Loving the simple elegance of the freshly fallen set. Great release so far. I adore Melissa’s Jolly Holiday set!!! Super cute! Outstanding products and beautiful projects. I just love Christmas! Everything is so pretty…..it’s gonna be a great release! Great holiday inspiration featuring the new products. I especially like the holly tag. Love the Jolly Holiday stamps and dies!!! So fun!! The new snowflakes are beautiful as well. I love all the stitched dies! Super cute cards! Wow! Awesome projects as usual! I especially adore the Hanukkah cards. I just love the new stitched elements! All the cards are amazing! Jolly Holiday is lots of fun! Beautiful cards. I love it all. I’m loving painted poinsettia and jolly holiday! I love the colors you used with the snowflakes, and the stacked gift is so cute! I like the flexibility that Freshly Fallen will provide for projects all year round. Such wonderful projects today!! Love the stitching dies….can’t wait to see more of them! Would love to try stitching on cards-these new dies would make it so easy! This is another great release. Freshly fallen has such fun shapes. Your color combinations are beautiful. Oh my! These are all so lovely. I especially like all the felt dies. So many great little gift ideas! Love all the stitching, it takes me back to my youth when sewing was everything! Many hours of great memories. The stitched dies are genius!the stacked gifts from jolly holiday is a favorite too. Those chevron trees are awesome and so is the stitching dies and I can’t forget the snowflakes! Beautiful!!! Thank you, thank you, thank you for the Chanukah stamp sets. All the projects are beautiful. Beautiful projects. I can’t wait for the full reveal. I’m loving the hanukkah set. What a great release so far. can’t wait to see what else you have planned. Beautiful projects! Love making my Christmas cards, and this release is very inspiring…can’t wait to see the rest! Love the seasonal stitched dies! I absolutely love the trees in Jolly Holiday!! So many wonderful projects using those fun products. I’m loving the Seasonal stitched dies. What beautiful creative designs for the holiday season today! Another day of greatness!!!! Love all the projects–can’t wait to see more!!! Love the modern look of the Freshly Fallen Snowflakes! I love your Jolly Holiday cards, especially the one with the sacked stripes! So cute! Love the Jolly Holiday set. The bold, modern designs are super. What great trendy cards! Love them all. Love the Hanukkah cards. Thanks! The 15th can’t come fast enough. Winter Joy captured my top fav of the day today!!! The trees are a wonderful change. The faux snow is the perfect embellishment! Such fun cards for Christmas. Can’t wait for the full reveal. The stitched holly is my favourite today! A very merry contemporary this release. Love the new look to the stamps and dies! That tag’s a must have! Gorgeous projects! This release is looking to be amazing, I really love the Seasonal stitching dies. Love the bold, graphic look of Jolly Holiday! love the tags with stitching accents. Definitely time for felt on my projects. I love everything in today’s reveal. I don’t think I have just one favorite! I really love the new snowflake set. So different! I also really love all the new stitching dies! Love this release as always, especially Freshly Fallen, beautiful. The jolly holiday and freshly fallen sets are really cute. The stitched dies have caught my eye too! You all have created beautiful cards and projects! Excited to see what is in store for tomorrow and the rest of the release! Thank you. Amazing designs. Such great projects. The stitching dies are FABULOUS and I love the modern Christmas trees and layer building snowflakes. WOW! Great stamps and dies – beautiful projects! I really like the seasonal stitching dies. Those look like a lot of fun! Beautiful cards! I love the Winter Joy and Peace on Earth cards. The use of non-traditional colours is really nice! The Freshly Fallen set is my favorite….. I’m a sucker for anything with snowflakes! Getting inspired to make my Holiday projects come to life! Great projects! Love the snowflakes. It seems I can never have too many of those! Love the snow flakes and I’m excited about the Snowglobe Sentiments!! Such pretty cards today! The DT is always so good at showing a wide range of ways to use the stamp sets! Awesome. Those snowflakes are so creative. Reminds me of etch-a-sketch. I’m also loving the 3D berry stitching die set. So much fun. Think my granddaughters would live making these. I’m so excited for the 15th to arrive. Wonderful cards..First one my favourite ! The snowflakes and stitched dies, then jolly holiday. Wow, such beautiful cards today!! The clustered berries are a really cute idea. I like how a gift card fits in the new tag die. Very clever! Fantastic projects! I absolutely love the new stitched dies! So many cute projects. Love the snowflakes and modern Christmas trees. I love all the stitched dies!!! Freshly fallen is beautiful! Wow! What wonderful new products. I especially love the snowflakes! Fun projects!! Cute stitching dies!! What beautiful projects everyone has created for today’s peek. I love the beautiful tag you created, Nichole, (that berry is so darn cute!) and it’s such a creative way to present a gift card. Yeah, more Hanukkah stamps! They are so hard to find. Love the Freshly Fallen cards – just beautiful! That Erin is SO clever! I can’t get over that adorable holly berry! Holiday crafting has never been so fun! Thanks for the chance to win these fun goodies! I love the Peace on Earth card. I’m becoming enchanted with the stitching dies. blown away today! Love love love freshly fallen! Seasonal stitches are awesome too! Those chevron trees are so cute! Love the release so far. Lots of great projects. Looks like another wonderful release at PTI. I love the holly berry! And the snowglobe sentiments is a must have. Great projects, lloking forward to the full reveal! Love the new Hanukkah set! All samples are beautiful! I just love the font on that “love and light” sentiment!! So pretty. Love the clean lines of Jolly Holiday. Another great release! I love the Freshly Fallen set! So clean and simple! Beautiful stitched tag/gift card holder, too. What fun! Such an awesome release. Definitely some sets I want. All the creations are so so gorgeous! I particularly love the stitched bows and candy canes. Wonderful projects! I epspecially love the Hanukkah cards and can’t wait to see the full reveal of Festival of Lights!! Fallen in love with the stitched dies! Fabulous–love all the stitching dies. The stitched dies are my absolute favorite! yay for Christmas.. loving all these cuties.. The new holiday stitching dies are just great. I love the holly and the dimensional berry element is amazing! Another beautiful day. Thanks for all of the lovely creations. So many beautiful projects ladies! I really like the technique that Melissa used on her trees. As well, the felt berry & leaves on the awesome tag are adorable! Love your dies…especially the snowflakes! Beautiful cards today!!! Amazing Inspiration!!! Loving the new Hanukkah set!!! Amazing job girls!!! Love the stitched dies. I can think of so many things to use these on! I love how you showcased everything today. The vibrant, fun Jolly Holiday cards sold me on that set!! What GREAT holiday cards!! Oh gosh. I thought I was going to get off easy this month but I like too many things already, especially the Hanukkah set! The stitched dies are fabulous! Awesome products! I’d love to win. Oh my goodness! They are all amazing! I want them all! So many options. It is just better and better. Anxious to see all the stitching dies in use – the snowman looks adorable! I love this time of month to see all of the creative goodness! Christmas pieces are the best! Another gorgeous release day! Love the font in the Love & light sentiment! Really love the snowflake set. Fun! That Hannukah set is just perfect! Love it! Love the look of the snowflakes, and the Hanukkah set is gorgeous! So lovely! I really am liking this reveal. I love the rainbow trees with the irredescent snow, beautiful! Fantastic release as always. Love the new stuff. Thanks for always inspiring. Love the Freshly Fallen set. They could even be used as flowers as well. Each day gets me more excited to start my holiday projects early.the card samples are beautiful. Wonderful, beautiful projects today. These new products are looking awesome! Such beautiful cards. I can’t wait to use those trees. Love the Holiday Double Cuts “JOY”. Is it new? I couldn’t find it on your website. I would love to see a complete alphabet like the “JOY” die!!! I could see all the potential in the Freshly Fallen snowflakes right away. And your cards …Wowzer! I just love the simplicity of that set. Also love what you did with the Christmas trees of the Jolly Holiday set – using the backs to stamp as well. Great ideas all around! Gorgeous projects and design samples this month. I always look forward to the Holiday release! Love the jolly holiday! WOW! I love Christmas! Such cute new products! Love Jolly Holiday! The chevron trees are sweet! I am very excited about the two new Chanukah sets and am already envisioning holiday projects using them. 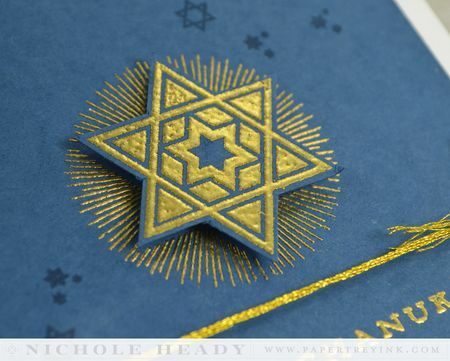 The Star of David card on enchanted evening cardstock with gold embossing powder is beautiful! Wow, everything is awesome…all the projects are beautiful! The Love & Light Shine card is simplistically, stunningly, beautiful! It took my breath away. Freshly Fallen reminds me so much of spirographs we would make as kids! Love it! Beautiful projects! I love the Jolly Holiday set, so cute! Another day of wonderful inspiration!! So luscious, so charming, I love all of it!! I am completely in love with the gift card holder embellished with the felt! Egads, such glorious inspiration! Really puts you in that Holiday mood! Loving the Holly Stitching die! Everything is absolutely stunning! I adore Jolly Holiday and Freshly Fallen!! Oh my! I am loving all of these Christmas creations! The snowflakes, the trees and all of the stitching accents….. I want it all! Love the snowflakes, tags, and new stitching dies! Wouldn’t the dies look great on little Christmas baby booties? Thanks for the chance to win a gift certificate! It’s so nice to see Hanukkah stamp sets. And Jolly Holiday is so fun and whimsical! Loved the gift card by Nichole. Love the modern Christmas trees and the beautiful snowflakes! I LOVE snowflakes, and the ones from Freshly Falling are soooo beautiful! Can’t wait to see the entire set. And since I just got the snowglobe shaker dies, I’m very excited about the snow globe sentiment set. I already have lots of Christmas sets but Jolly Holiday looks like fun! I love all the stitched goodies! Love all the new stitching dies! Fantastic gift card tag! The Freshly Fallen designs are beautiful. Glad to have even more sentiments for the snow globe. The new stitched dies are so much fun. All beautiful cards, this will be a great release! What a fun release! Love all the cards! Just when you think you have enough snowflake stamps. Love Freshly Fallen. Really enjoyed today’s projects! Can’t wait to get my hands on the stitched tag dies and the Freshly Fallen stamp set! Oh, the wonderful cards that were made today! LOVE the stitching dies, and I’m dying to find out what some of the small dies (i.e. little square) are for, but just the holly, with the fabulous swirly piece, have me sold on that set. I wondered how you could possibly add to the Hanukkah sets from a the past, but wow! – you hit it out of the park. 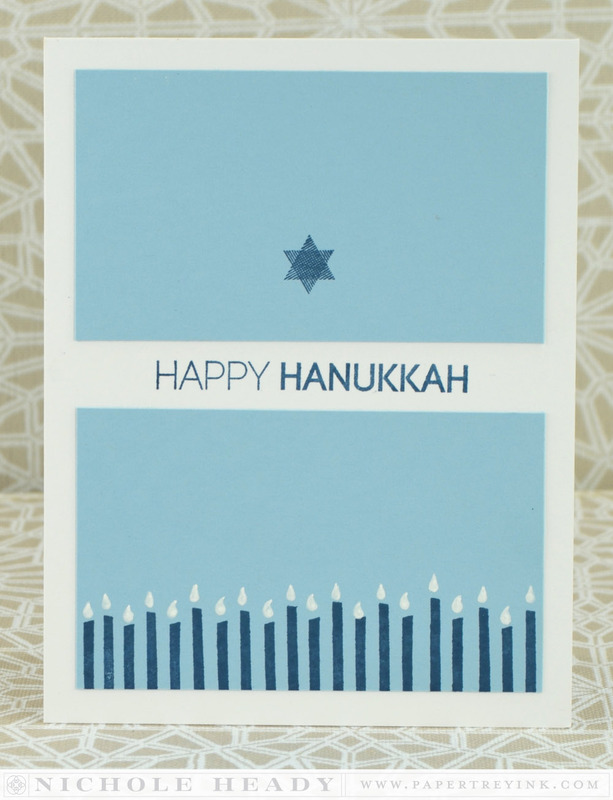 Your cards using the new Hanukkah set are as fabulous as all the other past Hanukkah cards. There’s only one problem this year, and that is, you have created so many ‘must haves’, than it is kind of paralyzing. I think Betsy’s latest kit would have sold out in a day if we hadn’t wanted all those great dies that came out right before. Still must say though, Papertrey packs more bang per buck, than any other company out there. Love the Freshly Fallen set and the stitched dies! Oh good golly … I can hardly wait to have new products in my hot little hands. So excited to get started on holiday cards! Great release thus far! Beautiful card designs. Another fabulous day! The pocket tag is AWESOME!!! That gift tag is so cute! What a fun way to do gift cards! Wow – what a fabulous set of stitched dies for this round. I have to say the snowman stole my heart! Gorgeous new stamp sets and you really showcased how easily a simple stunning card can be made – important with the holidays coming up! Loving all the new stitching dies…that snowman looks like so much fun. Can’t wait to see more – thanks for the chance to win! All these sets are perfect for creating a multitude of holiday cards with simplicity and elegance. I love the Jolly Holidays and the card with the colorful tress! Thanks so much! LOVE the Hanukkah designs!!! I’m not Jewish, but my neighbor is and it would be lovely to make him a card this year with special stamps for that holiday. What fun projects! Love the new stitching dies and Melissa’s Jolly Holiday. Melissa’s trees have me swooning! Love them, love the set! Freshly Fallen reminds me of all the designs I made with my Spirograph – I’ll have to get it out and play. The multicolor trees are so festive. Love those chevron trees from Jolly Holiday and the stitched tag. Happily I need no more snowflakes. I love all the new stitching elements. They are so cute and make really great embellishments. This is a wonderful release! 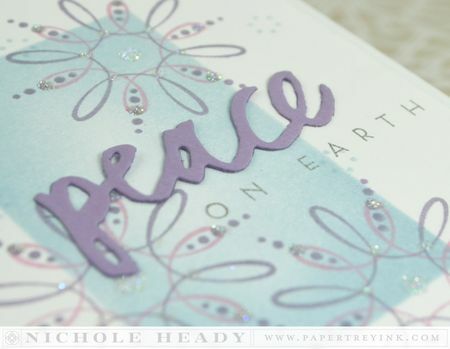 Nichole, the Christmas Cheer tag is beautiful and the Peace on Earth card in all it’s glitter-glory is so pretty. The chevron trees stamped in those rich bold inks has to be my all time fave 🙂 Everyone’s projects are just an inspiring winter wonderland of beauty! Not only do you gals design the greatest stamp sets and dies, but you always create such fantastic cards (traditional or non). Planning to make my Christmas cards again this year but have to decide on a design soon. Thanks for all the inspiration! Well, I just absolutely love the rainbow-esque row of trees using the Jolly Holiday set- I’m going to have to have that set now! Freshly Fallen is my favorite. Really like snowflakes for winter projects. Very pretty cards today! I think Jolly Holiday will be in my cart! The stitched holly leaves are adorable!! Another fun release reveal! So many great stamps and dies to create truly one of a kind cards, tags and embellishments. My favorite is the tag gift card holder. What a great idea. Love the stitched felt embellishments. That gathered berry is just WAY too cute, Nicole! Love the Hanukkah cards. Blue and silver just go together so well! Oh my gosh, so many lovely Christmas projects to get us in the mood. Fabulous projects love them all. 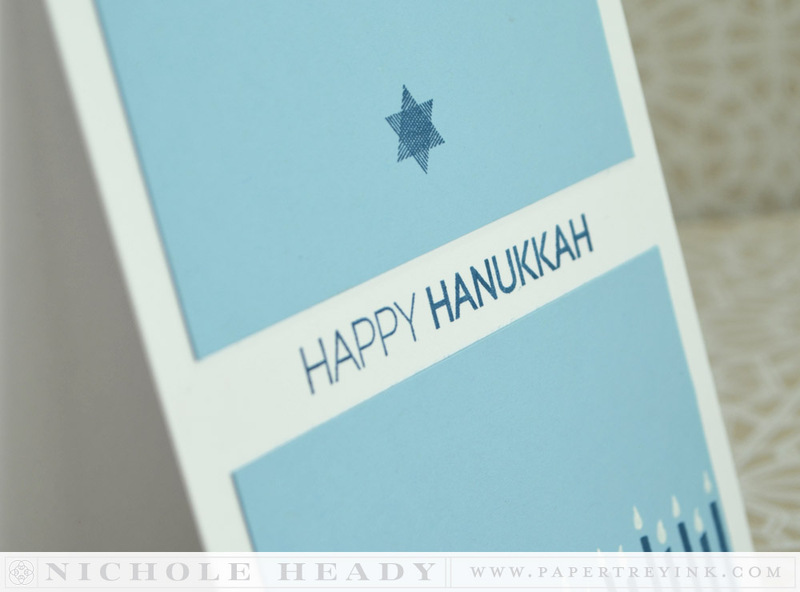 Your Hanukkah cards are absolutely wonderful Nichole…really beautiful! These stitched dies are amazing. 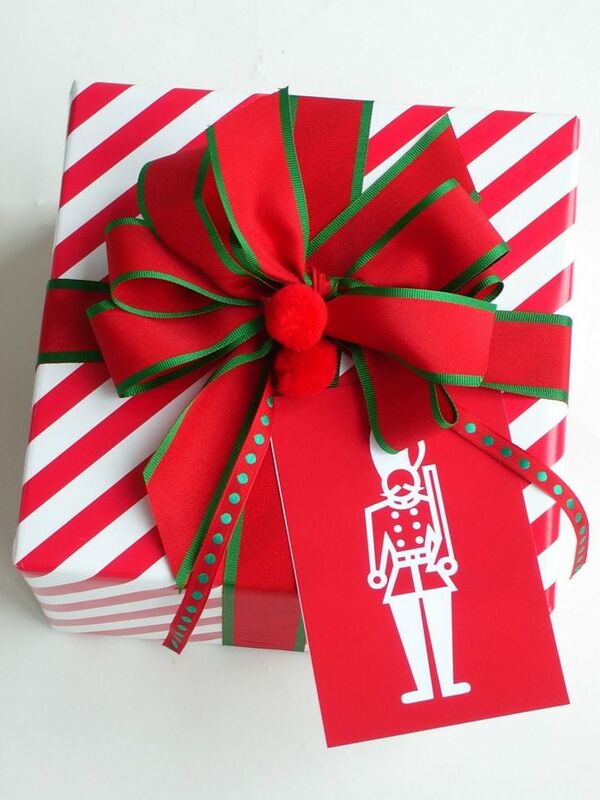 The bow could be used for fun dimension on so many projects and the candy cane and holly are the cutest! What fun products and all your cards are so beautiful Nichole. The reveals are my favorite part of the month, such great ideas from all the designers. i love all the fun ideas with the snow globe dies, along with everything else i’m seeing today! As ever, beautiful projects Nichole. Love the new stitching dies. Loving all the projects today. Can’t wait until the 15th!!! Love the Freshly Fallen set! LOVING those die sets to bits… I can’t wait to see what the DT members come up with! Fabulous job ladies! Though I celebrate Christmas I have quite a few friends who celebrate Hanukkah and that stamp set would be just perfect. TFS!!! Gorgeous cards today, from all the ladies. Can’t wait for the 15th! More fun today. Love the snowflakes, Jolly Holly and the beautiful Hanukkah card with the soft blue stripes. Can’t wait for more tomorrow! Great projects! Love the new stuff! You had me at…snowflake. I love this set. Reminds me of Spirograph. Thanks!! The Jolly Holiday set looks so fun! I love Christmas and it’ll be perfect if it’s a white Christmas. Unfortunately, not where I’m at. Great features. Thanks for sharing. Beautiful projects today. My favorite is the stitched holly tag. All the cards are so lovely. I am so inspired to get those Christmas cards started! I love how dainty the “Freshly Fallen” stamps look on a card. This release is AMAZING. Oh the projects totally get me into the Christmas spirit!! Love the projects this month. Wonderful mix of holidays to celebrate!! Love everything, as usual! It’s nice to have some new additions for my Jewish friends, the Hanukkah cards are so pretty! Not only is Freshly Fallen fabulous for snowflakes..These babies are going to work ALL YEAR as SPIROGRAPH groovy graphic elements!!YAY!!! I’m loving the stitched shapes! I am thrilled to have more Hanukkah stamps in my stash! I love the fonts on all of the new sets! Really love the look of those snowflakes – very unique and they look like they’d be fun to layer! Love the stiched candy cane and holly dies. Love the modern look of Jolly Holiday! That stitched pocket die is also so cool! I love all the Seasonal Stitching! Such a fresh and creative idea! The snowflakes look darling, and I can’t wait to see all of the stitching dies. However, the set that inspired me today is this sentiment set for the snow globe dies. Can’t wait to see the rest of these! Always love holiday stamp sets! My today’s favorite is the jolly holiday set. Love the dies. They add so much to card projects. Love the stacked boxes card as well. The stitched tag is my favorite! That Christmas tag is gorgeous and I also love the jolly holidays set! I love all the new products…especially the Jolly Holiday Set. Tks for the creations. i love those freshly fallen images. so pretty. well, as is everything else! The jolly holiday set is coming home with me! Love the chevron trees! Oh…I just love everything so far. How will I ever decide? Fabulous projects…. just love the bright and beautiful chevron trees! I’m loving the new seasonal stitches dies! I can’t wait to get my hands on them. 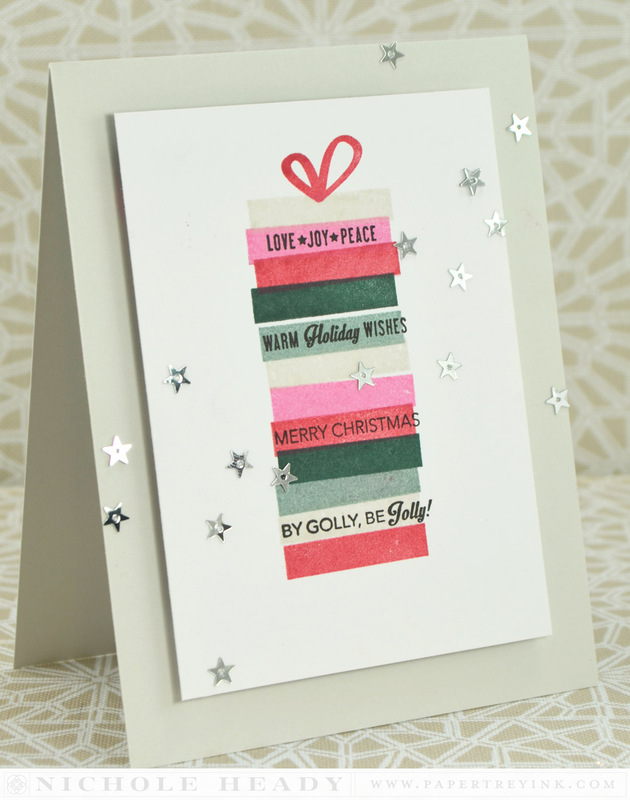 Love, love, love the Jolly Holiday set and the clever use of both sides of the tree stamp! All of these wonderful stitch dies for Christmas are fantastic! I love them all! Wonderful snowflakes too! The Hanukkah cards are my favorite. I love all the designers projects today. The non-traditional pops of colors used on the Christmas cards gives me such inspiration. Freshly Fallen is winning me over. Also like the Festival of Lights set. Could use those candles for birthdays too, right? I can’t express in words how wonderful this new release is other than outstanding. The projects are beautiful and the talent is amazing. Thank you for the opportunity to win! I am sooooooooooo excited about this new release!!! Love those snowflakes and the cute little tag!! Those new loopy snowflakes are super fun!! And I absolutely LOVE the stitched pocket tag you created!! The dimensional holly berry is fabulous!!!! I’m planning to make a bunch of Christmas cards this year and also some gift items for family, neighbor friends, and my husband’s co-workers. Would love to get my hands on some of these new goodies to incorporate into those projects!! These are some of the nicest holiday stamps I’ve seen in a long time-great addition to anyone’s collections! As always, thrilled for new stitching dies! And love Lizzie’s snowflakes – definitely see them in use for winter and all year long! I love that Christmas tree card! Love the colors and the amazing tree stamps. Can’t wait!! I absolutely love the Christmas Cheer tag. The stitching is beautiful and the color combo is gorgeous. It’s been hot here in southern California. 85-95 hot.. But seeing these posts are really getting me in the mood for some Christmas card making! I might just splurge and turn the A.C. on to 70, get a warm cup of tea, turn on a Christmas playlist and craft away today! Merry Merry to you! I love all the seasonal stitching dies! What a great look! The creative team did an amazing job showcasing everything! I really love all the projects today. Very pretty and creative!! So many great items, my list keeps getting bigger!!! I love all these holiday stamps and dies. Freshly Fallen looks like so much fun. Can’t wait to get this set! Beautiful, just beautiful. I really appreciate the instructions. Beautiful cards! I love the Chanukah designs! Who doesn’t love snowflakes! Freshly fallen is my favorite today. thanks! Just gorgeous. Love the Hanukkah set. Love the seasonal stitches dies! Great projects! I just love the mod snowflakes! What a great stamp and die set. The Jolly Holiday set looks like a winner, too! Thank you, Betsy, for more sentiments for my snow globe! Also, I LOVE your card ideas today! Love today’s release projects. The Chanukah cards are so elegant. Loving what I am seeing! You sure know how to put one in the Christmas spirit, even though we are going through a hot spell! I can’t wait to see more of the stitching, too! Beautiful new products as usual. I like the new dies! Oh my goodness… I love all of the new dies. That tag you made is super awesome!!! I can’t have enough snowflakes and the new freshly fallen snowflakes are no exception!!! Wonderful preview. I love those graphic snow flakes. Great projects. Love the new jolly holiday set and the Hanukkah set. Thanks for sharing all your beautiful ideas. I appreciate the opportunity to win. Can’t wait to order. Beautiful samples!! And I am LOVING all of the stitching dies….love them!! Loving today’s projects. My wish list is growing long already. Love all the stitched Christmas dies. The stitched holly die and stitched tag both look amazing. All design projects are lovely and full of inspiration. Your stitched tag is just the cutest – love it!! I love the stitched tag die! And love the pocket on the back! Great for a gift card or a card for a personal message! Awesome! The love and light font is so beautiful! These are awesome, I love the cards that were made with these sets. The Seasonal Stitching Dies are over the top. I love all the projects and unique ideas. What a great source of inspiration to start making the holiday cards! Congrats. These are all beautiful! Every month it is the same. I can’t wait for release day. Every month there are new items that I think I can’t live without. What a wonderful job you do!!! The stitched holly die has me jumping for joy. Fantastic projects! Love this release! Such beautiful sets shown today. And Erin has done it again with her stitched dies. I love the non-traditional colors! Fun Stuff, love all the DT projects. Freshly Fallen looks beautiful! Can’t wait to see the full reveal! Love the new releases and can’t wait to get started on my holiday projects! Today’s projects are all wonderful! Love that stitched pocket tag especially! Awesome preview. Like the “Freshly Fallen” Snowflake and also the “Jolly Holiday” Set. The modern style is great. Anxious to see the stitched snowman projects. I’m loving the snowflake cards and the love and light card. They are all so very elegant! so much holiday inspiration. can’t wait to get started on my holiday cards. thanks. 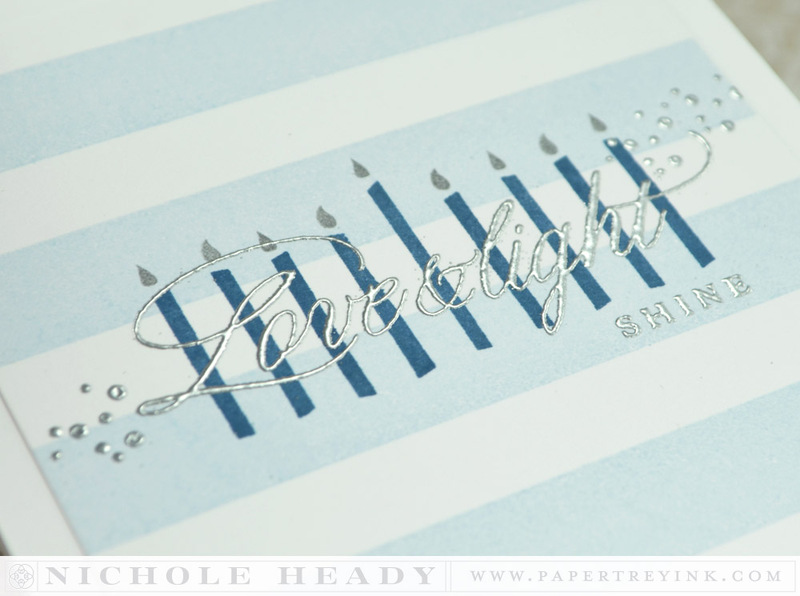 I love that Love and Light menorah card–the blue and silver are so pretty! The Hanakah set is lovely. And the fact that the stitched tag dies fit a gift card is pretty awesomely convenient. Thanks for the inspiration DT! Very pretty cards. I think the Hanukkah cards are lovely. Thanks for sharing these with us. Super projects and I love the new stitching dies! Ooh the Freshly Fallen snowflakes remind me of the spirograph set I had as a kid. So much fun! Loving the look of the Jolly Holiday cards! LOVE it all again today!! I LOVE the new stitching dies!!! Wonderful samples, as always. Wonderful new sets. Cheers. Great samples by the DT and great dies. So much beautiful stuff! Thanks for the chance to win! Yay! New snowflakes!!! Bring on the cold white stuff! Such a beautiful snowflake stamp set – cannot wait to see more. I love all the stitched dies. Those simple stitched lines add so much to each and every project. Thanks so much! I am so in love with that Holiday Double Cuts font!!! Please, please, PLEASE go one better and come out with the entire alphabet in it!!!!! Pretty Please? 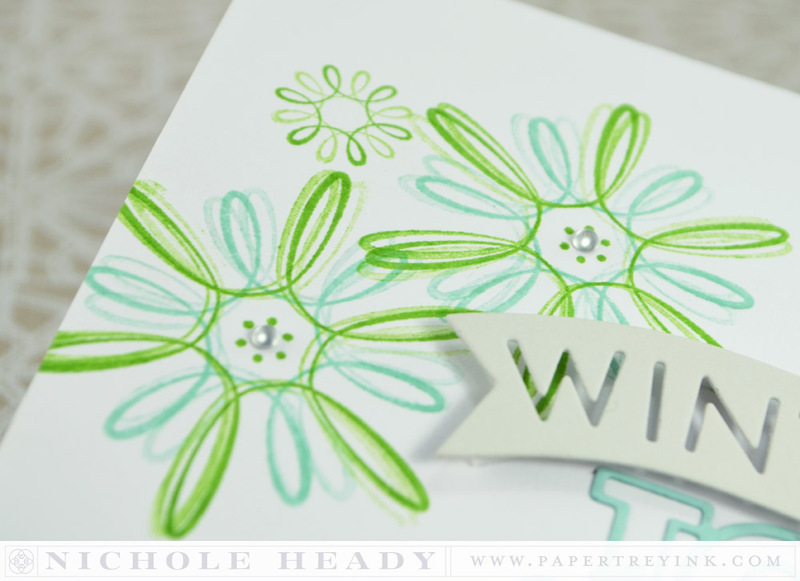 Very beautiful pieces for this release…what wonderful additions to stamp and die collections! I really love your colorful and glittery Christmas Tree card along with the blue/purple snowflake card! Both are so pretty and inspirational! Love all the wonderful looking stitching dies introduced today too! Those trees from Jolly Holiday are fabulous! Love all the stitched dies. Great inspiration. Beautiful projects today. I love the stitched tag especially. More pretty projects! I love the starburst star in the Hanukkah set. The Christmas cheer tag is so wonderful! I love all the stitching and felt! It creates such a warm and cozy feeling project! The stitched dies are awesome. Love the holly, candy cane and snowman. perfect for the barrette covers.Definitely in my cart. Beautiful projects! I am totally in love with Freshly Fallen! Love the simplicity of the freshly fallen set. Thank you for the beautiful inspiration. I love how the Freshly Fallen set can be use to create layered snowflakes. Beautiful! Love the snow flakes!!! Another must have !! Your cards and tags are absolutely beautiful! Love the colorful Christmas creations and the stamps are incredible! Love all the new stitched shapes! Great release! Great projects! What a great release & I’m really loving the elegance of the Festival of Lights….not a set just for the holiday season. another great preview – can’t wait to see the full reveal. Love Freshly Fallen and Jolly Holiday and their coordinating dies. The projects were all so beautiful. Thanks to all for sharing. Love these projects! Original and colorful! Very nice new stamps! I love the stitched dies, especially the snowman! The card projects are all very inspirational. There so many stamps and dies, it is hard to pick my favorite. They are all grand. Lots of gorgeous inspiration today. Love the bright colors of your Jolly Holiday trees card. I LOVE the Hanukkah cards! Such fun cards–I am really liking the Jolly Holiday set and I love the bright Christmas card you made! Beautiful inspiration from the DT today! Love the Jolly Holiday and Freshly Fallen sets. The card with the rainbow trees is so striking. It gives me great inspiration for Xmas cards. Oh, I just love everything–especially the Jolly Holiday card. It is so bright and colorful–love the nontraditional colors. I just LOVE your stitched holly, gorgeous! Oh my goodness, I cannot begin to tell you how excited I am for the Hanukkah sets!! The fonts, the gorgeous details of the star of David…just beautiful! Hope to see more projects using this set! Agreed Marty, I think it could be beautifully coupled with the previously released Mazal Tov set and used for different holidays throughout the Jewish year! They are all fantastic BUT the multi colored trees are my favorite !! WOW!! I think my favorite card is the present one. What a fabulous way to use strip stamps!! You are making this so hard to pick just one set!! Delightful modern take on Christmas today. Love all of Erin’s new stitching dies – the holly berry looks amazing – so dimensional! Loving the Jolly Holiday set – so very modern! I love how you cut the paper on the last card & put the sentiment in the middle – so simple, but it really adds something! Beautiful cards, great release! I can’t wait to see more samples! Thanks for sharing your ideas. The PTI Team never ceases to amaze me! Beautiful products and projects! Absolutely love the new stitched dies. So fun! I love all the stitched effects and these projects are gorgeous! LOVE the loopy snowflakes & everything in this FABULOUS release! Your cards are wonderful today! I can’t wait to see the full reveal of Festive Lights. The candles can also be used for Kwanzaa cards! Love the trees…your bright and colorful tree card is to die for! These are awesome! I love the tree card! Like the look of the Jolly Holiday set! Adding to the wishlist. Adorable an beautiful cards and tags from your whole time. All the new stuff is always so exciting! Love the modern take on these holiday elements! Great job PTI! Love all those new stitched dies! The non-traditional Christmas colors are perfect!! Beautiful stamps and dies! WOW!!! Freshly Fallen is a beautiful stamp set. 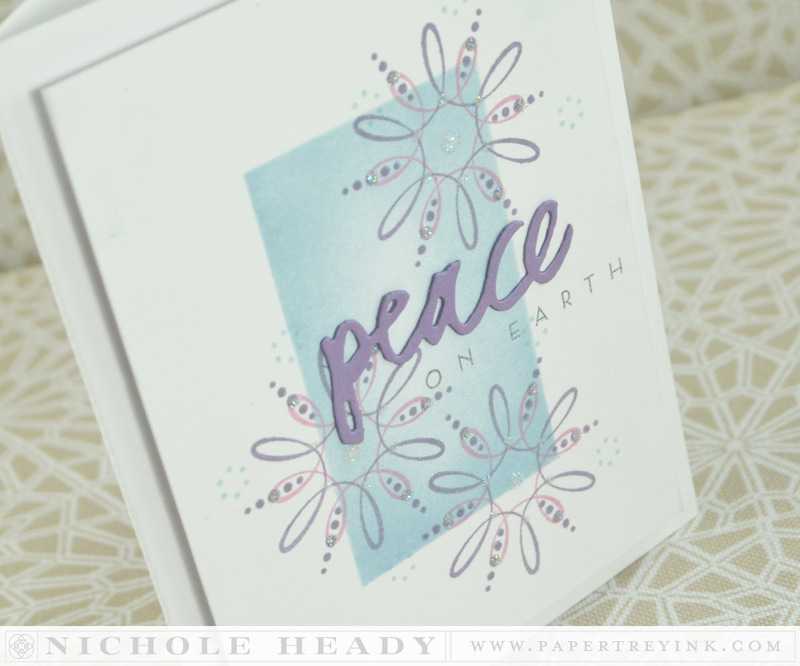 I love the purple and blue combination of the Peace on Earth card! Love the Jolly Holiday set! Today’s cards are wonderful as always!! WOWZA!!! Awesome cards using these fantastic sets. I love all of the Seasonal Stitching dies. The design is the Freshly Fallen is so unique! Love all the products featured today! Wow. The loopy snowflakes are gorgeous! And I LOVE the hanukkah samples! I love that stitched tag that is also a gift card holder…so very clever! Love everything! So much fun and inspiration!!! The Seasonal Stitching: Holly felt accents are adorable on the Christmas Cheer tag!! Love them all, but my go to picks are Jolly Holiday and Snow Globe Sentiments. In a category all by itself is the Stitched Tag with Stitched Holly, gift card – gotta have it! Love the look of stitched dies! Beautiful artwork! I must say that the tag with the gift card pocket is simply brilliant! I can see using it for so many occasions, not just Christmas! Love Jolly Holiday! Thank you for all the beautiful creations already this release. Can’t wait to see everything. I just love it all, can’t wait for the 15th! I love Freshly Fallen, how beautiful! They look amazing in contemporary colours. I love all the new stitched dies!!! Beautiful!! You never disappoint us. Great projects presented by the team today! 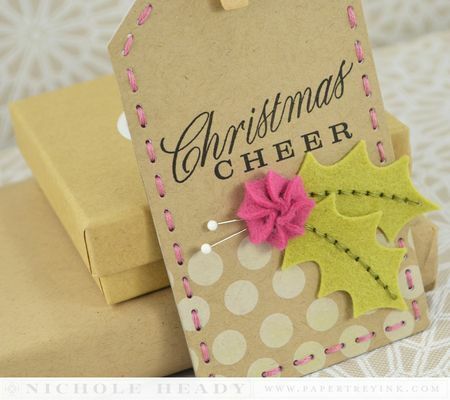 I LOVE the stitched tag with the holly leaf and berry. I can’t get enough of the stitching dies. I love the Seasonal Stitching Holy. I just love holiday cards and projects!! I do love the multi color trees. Oh wow, what great Christmas products. Really love all the new stitched dies, especially the snowman. Love Freshly Fallen. I could also see using it to make flowers. The Jolly Holiday cards are wonderful also. So much inspiration. I love Freshly Fallen, I can see using as something other than snowflakes. Such great projects! Love the cool snowflake design. 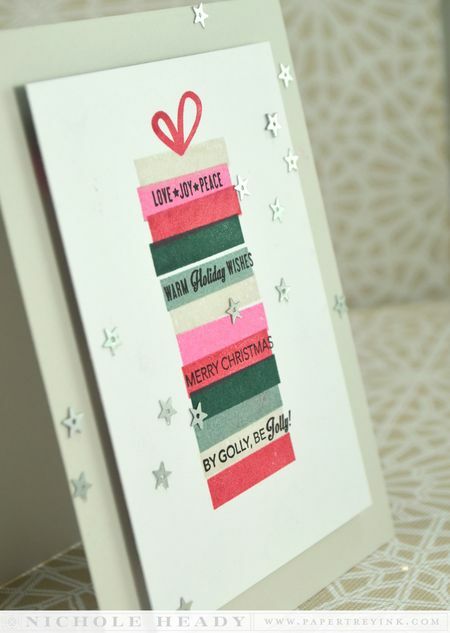 Love the use of COLOR on Melissa’s Holly Jolly card-so simple but stunning! Also love the two ideas on how to use the Hanukkah candles. Such cool stuff. Great snow flakes. Especially like Laura’s style and cards. Everything is great! wow… more gorgeous projects today! the festival of lights set is so beautiful! great preview-looking forward to the full release. loving the new snowfall stamps – not that I’m ready for winter! My favorite today is Freshly Fallen. Love the delicate snowflakes and all the different colors you used in the cards. Freshly Fallen looks great! And great to see different things continuing to come – must be hard every year with Xmas! So many pretties…It will be hard to choose this month! I’m loving the designs and colors of the projects using Freshly Fallen! Ok, well actually they are all wonderful. Great job! I would love to win this for my wife who is a PTI fanatic. I can’t wait to see what’s to come because everything has been great so far. Fabulous, can’t wait for the rest of the release! Ooh! I am loving all of the holiday goodies!!!! And more stitched dies! Yay! Those chevron trees from Holly Jolly are fabulous with their spot-on mix of retro and modern. If I made a mix of Christmas cards, I’d buy this set for sure. Erin is quite the stitching QUEEN! All of her dies are so much fun to use. Another great day of beautiful projects! Love the stitched tag! Looks like a great release, I can’t wait! I can’t retrieve my jaw from the floor! Your cards are STUNNING and GORGEOUS and DELICATE and MESMERIZING and I can not find more adjetive….sorry! I love every single one of them! Congratulations! As I think about what to buy I am including the snowflakes and I live in Puerto Rico which is a tropical island and we don’t see snow…boy are you a good saleswoman! The stitching dies are amazing. Can’t wait til the 15th! Love the tags and all the stitches items. Love the bright, modern feel of the Jolly Holiday set! The Freshly Fallen reminds me of my old spirograph! And the trees are awesome! love all the new stitching dies! What a great preview. The holidays are just around the corner. Can’t wait to add this to my holiday collection of stamps! Love the Jolly Holiday set. Definitely my style! These cards are so pretty. It has me getting excited for the holidays. What s great release this is going to be, super excited to get holiday card making! love the stitched dies! can’t wait to try them out! The gift card tag is a great idea and I love the color combo! What a great preview of all these awesome products. Love all the super projects. My “must have” list is getting longer! The stitching dies are so cute…love everything!! These designs are soooo Beautiful! Love this release and those little dies are the cutest. Nichole, I love all the projects you’ve created. The Stitched Tag With a Pocket is my favorite. Thanks, for all the wonderful inspiration! Another great release. I love that the stitched tag die can fit a gift card in it. That will come in very handy. Beautiful projects! These are great stamp sets! I really like the modern Christmas tree. The card with the multi-colored trees really caught my eye! I love the stitching dies!!! I am loving the variety of products for the holiday season. There is something for me to make for all of my friends! Great new designs, love them! Love, love, love the Freshly Fallen! Love the variety of cards that can be made with these sets! Great! gotta have those trees….so cute! And love the snowflakes too! I love a new Christmas set every year! Anything with snowflakes makes my day, I can use them all winter long! Ohhh loving these so much! Love the bright trees! Love the new stitched products. Such amazing inspiration from all the team! Really like Jolly Holiday. Can’t wait to see more. 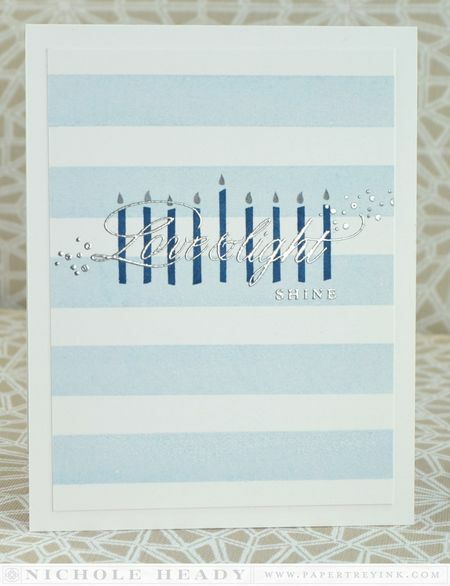 Oh, I so love the striped Hanukkah card! Super pretty! I’m looking forward to the full release of all this Christmasy goodness! The colorful trees are great! An awesome twist on what we traditionally think of for Christmas. So much fun! Loving all the gorgeous projects and fantastic products today. Making the Holidays fabulous! Really pretty grouping of products coming! Lots of new goodies. Thanks. Love the Freshly fallen dies and stamps! I really love your Hanukkah cards. They are so elegant! The bright colored trees are really fun too. Awesome projects! Yes, I will have to add to my small stash of Christmas cards – thank you for the inspiration and the chance to win! The Snowflakes are so pretty. I just love them. The holly leaf is so neat too. I love the Tag Gift Card Holder! I also use gift card holders to attach some cash bills for my grandsons for different occasions. Look forward to seeing tomorrow’s projects! Am loving all the snowflakes this month. Can hardly wait for release day!!! I really need more of the stitched dies. I see so many possibilities! Love freshly fallen, too! I just love the tags! Super projects. im delighted to know we’ll be able to celebrate a happy chanukah this year! thank you! The stitching die is cool–can’t wait to see more. It is so exciting to see new Hanukkah stamps. They are hard to find. I can’t wait to purchase these! Fabulous! The projects are stunning and definitely worth it!! Great release so far – loving Jolly Holiday! The new tag die and loopy snowflakes are great! And PTI continues to astound…another wonderful release full of beautiful stamps and dies! The creativity of the PTI design team is amazing, always giving us the most magnificent ideas! I really like the stitched dies! Such a cute idea! What a touch of elegance all these projects have! Oh and again great stitching dies! I love them all!! Wow! So many wonderful projects. Love the tags and stitching. Amazing design team! I like the new Fallen Snow set and dies. Thanks for the chance to win! Fantastic products, and I love what you all have created with them!! Now to decide what to use to make my Christmas cards with!! Great ideas! I especially love the how Melissa used the Jolly Holiday set. Beautiful bright colors! Loving the stitching dies! The snowman looks fabulous! Another fun set of products. 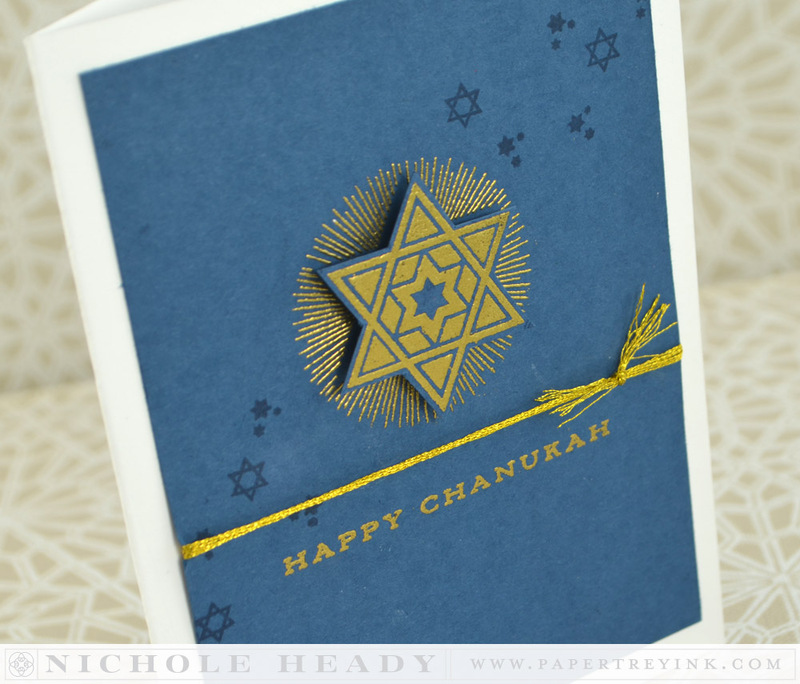 Love all the Hanukkah inspiration, and Freshly Fallen is gorgeous! I love all of your projects. Actually I love everything you create. Your projects always have such beautiful color combinations and are so well done. Such fun with all the new stitching dies. Lots to look forward to. My favorite has to be the Christmas gift card tag. I love the colors that were used, and the holly berry die gives the perfect touch. Love the Jolly Holliday Set. Also can’t wait to get the sentiments for the snowglobe dies. Been making a lot of shakers. Such beautiful and simple lines throughout the designs. Gorgeous! The stitching products really kick projects up a notch. Such pretty samples today. Love the stitched dies in felt and your lovely treatment of the berry. The Hanukkah cards were stunning! Absolutely love the stitching dies!! Can’t wait to get my hands on them. How pretty! I wouldn’t have been drwn to the stitches dies on thir own. But after seeing the inspirational projects, the are a must have! Love the cards and tag posted today. The holly berry is adorable. Can’t wait to see the rest of the stitching dies in action! Lovely projects and products, i especially like the kraft tag and the Peace on Earth card. WOW, what a great presentation, the artwork here is awesome, the New stamps and dies are Delightful……..Got 2 have, can’t wait !! Beautiful cards and great reveal! I love the hanukkah cards the most. Looking forward for the coming days! 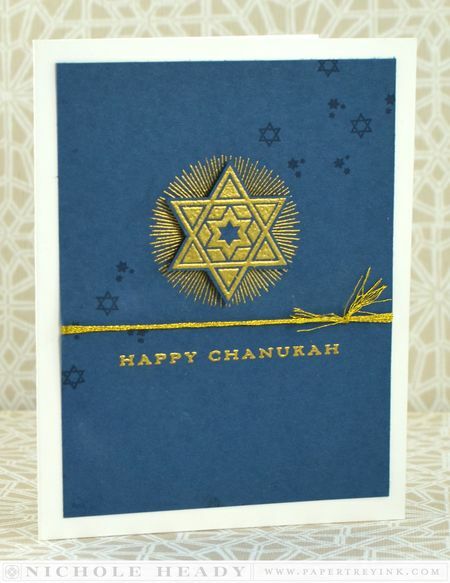 Love the Hanukka cards, I am always at a loss for fresh designs for my friends that celebrate Hanukka! Beautiful! Ohhhh….fabulous cards! So loving all the new dies especially the one that can be stitched! Thanks for sharing and the chance to win! Love the new stitched dies! All new products are fantastic!! Another great release day is coming…!!! What a great release todsy! Cute, cute ideas! I love the gift card tag…always a great way to include a special gift! I am in love with the stitched snowman and holly. Am really liking this release! Am especially happy to see Melissa back with a holiday set in her signature style! I want it all! Beautiful. I love all the projects today. Those chevron trees are too cute! Love the Jolly Holiday set! those snowflakes remind me of my old spirograph! Oh my goodness all these lovely stitching dies are dreamy! Beautiful cards and love the Freshly Fallen stamp set..
Can’t wait to see more of this new Smowman. Stitched dies are some of my very favorites. You ladies are so creative! I will be celebrating Christmas and plan on making ornaments from your most recent release. I am inspired by the cards that you posted featuring this upcoming release. I really like how you used non-traditional colors. I love the trendy designs of the snow flakes and the trees. Thanks for the opportunity to win! Love all the Christmas cheer! All the projects are amazing!!! As always, great stamps & dies. Beautiful samples for inspiration. Jolly holiday set is so wonderfully thought out. Great projects by design team. Wintery delight! The little treat box is wonderful! I could have so much fun making those! I really love that berry felt all gathered up. . . gorgeous dimension and I can think of a thousand uses. Fun!